Carrie Williams began her Playschool career in 2006 in the Orange Room and also spent five years teaching in the Blue Room with Miss Kathleen before returning to the Orange Room in 2013. Alyssa and Carrie grew up together at Miss Betty’s Day Camp and they are happy to continue that relationship in this new manner. Carrie and her husband, Hunter, sent their three children to Playschool. During their ten year stay as Playschool parents they enjoyed the wonderful co-op community and met some of their best friends and made many lasting memories. 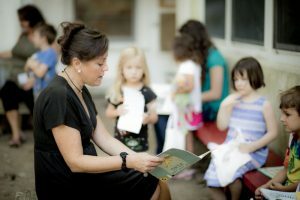 Carrie spent nine years running Auction dinner, seven years holding a position on the League board, and has held several terms on Charlestown Playschool’s Board. Carrie has also spent most of her life doing what she loves most, teaching children to swim. Miss Betty first hired her to work at camp as a swim instructor 40 years ago and she has been doing it ever since. It’s rare that a person can say without a shadow of a doubt that they are where they are supposed to be, doing what they are supposed to be doing. 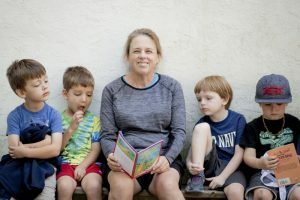 At Playschool, Carrie is surrounded by children who both amaze and inspire her and families who are so invested in their children’s education that they give one hundred percent of themselves both in the classroom and out. She counts herself lucky to be back where her life started, enjoying all that it entails. Catherine and her husband Robert have four children. Catherine holds a Master's Degree in Education and an undergraduate degree in Special and Elementary Education. She taught for ten years in a private school for students with learning differences where she also assumed administrative responsibilities, created thematic units, and was a supervisor in the upper school. Catherine home-schooled her children for 13 years and began coaching swimming in 2010; she is currently an assistant coach with TOPS Swimming. In her spare time Catherine enjoys spending time with family, gardening, reading, and watching British programs such as Masterpiece Theater. Alyssa has been on the Playschool staff since 2006, with the majority of her time being in the Orange Room. Playschool has always been a part of Alyssa’s life and it holds a special place in her heart. As a young child she went to Playschool for five years and has many wonderful memories from her years here. Alyssa earned her BA in Education from Immaculata College. 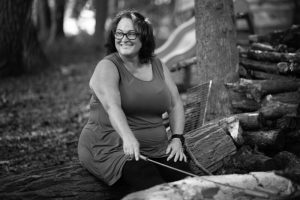 Alyssa and her husband Brad have two children who both attended Playschool, and in her spare time Alyssa enjoys walking in the woods with her dog and her mom (our Miss Pam). During each spring and fall, you can find Alyssa spending most of her spare time volunteering at the Charlestown Sale, and each summer you’ll find her running Playschool’s camp program with Miss Pam.